Over a span of two years, teams of students, faculty, and staff at the University of Wisconsin–Madison eliminated mandatory receipt printing at campus dining centers, restaurants, markets, and cafes. Within the first seven months of this policy change, receipt paper usage dropped by 88% in campus food service operations, saving money and other resources, reducing waste, and lessening a potential health hazard for employees and customers. “Do you want your receipt?” This common question, once asked at nearly every cash register on campus, usually was followed by the paper being tossed in the garbage. In the past, paper cash register receipts were accepted as a standard business practice and expense, serving as an important record between the service provider and customer and useful in providing proof-of-purchase and in settling disputes. At UW–Madison, receipts for student ID card (Wiscard) transactions also indicate account balances. In this environment, paper receipts represent an often unnecessary – and sometimes actively unwanted – use of resources. Many customers refuse their receipts, which pile up in messy heaps around registers or blow off customer trays to become unsightly litter. In addition, some receipt paper contains bisphenol-A (BPA), a chemical linked to possible endocrine disruption, making excessive receipt production and handling a public health issue for employees and customers alike. In 2013, concerns voiced to staff at the Wisconsin Union and the Office of Sustainability triggered a closer look at the volume and impacts of unwanted receipts. It quickly became clear that the resources invested were considerable: University Housing houses approximately 7,400 undergraduate students and runs 13 dining facilities and convenience stores; the Wisconsin Union operates 26 campus restaurants, markets and cafés. In 2013, University Housing’s Dining and Culinary Services logged an estimated 4.4 million register transactions and the Wisconsin Union more than 3 million. At that time, cash registers for both entities were set to automatically print paper receipts for every transaction. Based on an average receipt length of six inches, these transactions would generate 400 miles of receipts annually for Dining and Culinary Services and 275 miles of receipts annually for the Wisconsin Union, costing tens of thousands of dollars each year in receipt paper alone. The Receipt Reduction Project began as a simple question: is there a better way? This Receipt Reduction Project had several related goals. Establish baseline. The most immediate was to assess the volume of receipts produced on the UW–Madison campus and work with stakeholders to identify solutions that would use fewer resources, reduce waste and/or improve the workplace environment for student and staff workers. Examine existing policy. The project also assessed the feasibility of changing the long-standing campuswide policy in food service units to require printing a receipt for every transaction. This goal was essential for scalability and lasting impact. Create networks. The project aimed to build connections among different units on campus with distinct, but overlapping, audiences and goals. Raise awareness. 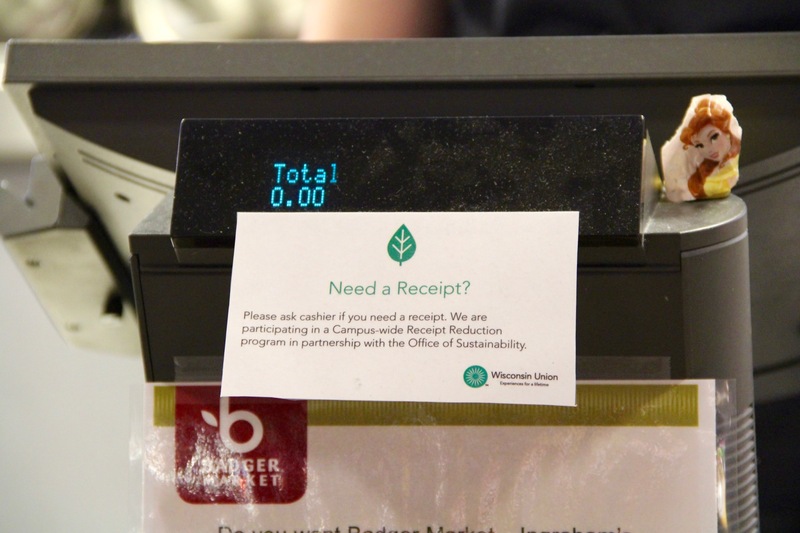 The ubiquity of cash register receipts made them a perfect opportunity to increase the visibility of campus sustainability efforts to a broad population. Support student-driven initiatives. A small group of dedicated undergraduates provided much of the impetus and student data, which were essential to show customer support and demand for a change in campus dining units. Publicize positive outcomes. Successful implementation of this project demonstrates the importance of sustainability to the campus as a whole as well as the ways sustainability projects can improve day-to-day life on campus. Defining the problem. In 2013, UW–Madison physics professor Duncan Carlsmith expressed frustration to staff at the Wisconsin Union and the Office of Sustainability about the number and negative impacts of unwanted receipts printed and discarded at campus cafés. He connected with undergraduate Rachel Feil, who developed the receipt reduction project while a student intern with the Office of Sustainability. Rachel also engaged fellow student Kyla Kaplan who, as chair of the Associated Students of Madison (ASM) Sustainability Committee, had also noted the abundance of unneeded receipts as a student and campus concern. Engaging stakeholders. Under guidance from Duncan and Office of Sustainability staff member Angela Pakes Ahlman, Rachel and Kyla reached out to several campus receipt-producing entities, including University Housing Dining and Culinary Services, Wisconsin Union, Division of Information Technology, Transportation Services, and the Babcock Dairy Store to learn about each organization’s paper use and customer needs, identify current practices, and offer initial paper-reduction strategies where appropriate. Identifying solutions. Duncan, Rachel and Kyla worked with Garage Physics, a campus makerspace, to explore various possible technological and entrepreneurial alternatives to printed receipts. Concerned about the BPA content of standard thermal paper (and that it was not recyclable in some states as “hazardous waste”), they also identified a BPA-free alternate thermal paper available from an in-state manufacturer to suggest as a replacement. Ultimately, however, they determined that the best solution was the simplest - eliminating the use of receipts altogether. Rachel further developed her receipt research in a senior capstone project for a section of Environmental Studies 600 on campus food-related waste, taught by professor Holly Gibbs and graduate student Tyler Lark, both in the Nelson Institute for Environmental Studies. Charged with creating a project around an existing sustainability issue on campus, Rachel, Ben Stansbury-O’Donnell and Chris Taylor (all 2014 graduates) researched and produced a “Receipt Reduction Guide” [see linked file] with information and recommendations for campus units interested in reducing paper use. Data collection and decision-making. The baseline data on transaction volume and receipt production clearly highlighted the value of a coordinated project addressing campus receipts. The Wisconsin Union and Housing Dining and Culinary Services represented ideal target units due to their large transaction volumes and interest in receipt reduction as a potential opportunity to better serve their customers and provide a campus learning experience outside the classroom. To collect customer-specific data, Rachel and Kyla worked with Dining and Culinary Services staff to assess student views on receipts through a survey distributed through ASM (UW–Madison student government) in April 2014. The survey garnered the highest response rate of any ASM survey that year, indicating a high degree of student interest in the issue. Of 3,018 respondents, 87% represented University Housing’s primary target audience of students who made a purchase at a Dining and Culinary Services facility within the prior year. Of the respondents, 62% indicated a preference for optional receipts, 35% wanted no receipts printed at all, and just 3% supported mandatory printing of paper receipts. In addition, 90% of survey respondents who indicated that they used their receipt to check remaining account balance said that checking balances online or at the register without a receipt was acceptable. In addition to the online survey, the capstone student team and ASM members held outreach events at Union South to directly engage customers, gain insights into consumer preference, and assess support for reduced receipt printing. During these efforts, the team collected over 180 signatures and piles of discarded receipts to demonstrate customer support for an optional receipt program. Rachel and Kyla also presented their findings at campus events and prepared a lengthy summary report for the Office of Sustainability and their partner units. Rolling out receipt-optional. Based on the student outreach efforts and ASM/Office of Sustainability survey responses, Dining and Culinary Services launched a pilot “receipt-optional” program in Newell Smith Hall in fall semester 2014 to evaluate feasibility, address anticipated challenges, and assess customer responses. This required creating an alternative to the automatic print settings on the cash registers. Under the leadership of dining directors Julie Luke (Housing Dining and Culinary Services) and Carl Korz (Wisconsin Union), Housing point-of-sale manager Jodi Bodnar worked with campus point-of-sale system administrator Kiley Groose to implement a temporary option to disable receipts by device on a daily basis. With the new settings in place, student employees were trained to print receipts only for customers who requested one for standard cash and Wiscard transactions. For record-keeping purposes, receipts were still printed for purchases made with credit cards or coupons. The pilot was deemed a success and confirmed the feasibility of making printed receipts optional from an administrative standpoint. Housing staff did not encounter any major problems and were able to work out small issues that arose. Kiley also worked with the campus point-of-sale software vendor to enhance the software with functionality to disable receipts by location globally, allowing easier campus-wide implementation. Dining and Culinary Services extended the receipt-optional changes to all of their campus facilities in late summer 2015, and the Wisconsin Union followed suit at nearly all of its campus restaurants, markets and cafés early in the fall 2015 semester. This project took approximately two years from idea to campus-wide implementation. The primary cost of this project was student and staff hours. Rachel Feil was supported as a paid student intern by the Office of Sustainability; Kyla Kaplan was supported by ASM; university faculty and staff members of the partner units completed their contributions to the project as a part of their normal duties and were supported by their employing units. Information gathering was completely supported by student and staff hours. Development of the Receipt Reduction Guide was supported by instructional funds allocated to the Environmental Studies 600 course. The survey and related outreach efforts were sponsored by ASM. There are no ongoing costs for this project - in contrast, it is continuing to save money for Dining and Culinary Services and the Wisconsin Union every day! The combined efforts have resulted in policy changes in both Dining and Culinary Services and the Wisconsin Union. The registers in all Dining and Culinary Services facilities are now receipt-optional for standard transactions (cash and Wiscard). Printed receipts are generated only for transactions made using a credit/debit card or coupon, or upon customer request. The same is true at the majority of the Wisconsin Union restaurants, markets and cafés, with exceptions made for a small number of locations that use paper receipts to track food items through production to delivery to the customer. These changes have been widely publicized in campus news outlets, assisted by Office of Sustainability communications director Jill Sakai. 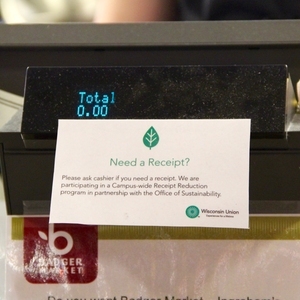 The Wisconsin Union has also promoted the receipt reduction measures to customers with prominent signs on registers at participating locations. These signs increase public awareness of both the project and the campus and Union’s dedication to sustainability. In the first seven months since implementation, the Wisconsin Union reduced receipt paper usage at its restaurants, markets and cafés by 37 percent compared to the same time period the previous year (47 cases vs. 75 cases), for a cost savings of more than $1,200. Dining and Culinary Services cut its receipt paper purchases by 93 percent compared to the same time period last year (15 cases vs. 220 cases), for a cost savings of more than $9,000. This should lead to annual savings of greater than $17,000. The vast majority of customer feedback has been positive. In May, this project team was awarded a 2016 UW–Madison Administrative Improvement Award in recognition of “outstanding work in process redesign/development or customer service/delivery that resulted in improved efficiency, increased revenue channels, cost savings and/or improved service delivery.” In the past few months, members of the team have also been in contact with a student at the University of Texas at Austin in support of her efforts to start a similar project on her campus and in hopes that the successes seen at UW–Madison can be applied elsewhere. Think broadly to identify campus stakeholders. We began by talking to several different customer-facing units that each used paper receipts in different ways. Although the results documented here focus on food service units, we worked early on with other offices as well. For example, we helped Transportation Services reduce the amount of paper used for parking tickets and other citations, such as eliminating the use of envelopes. Work with your campus vendors. Food receipts at first seemed untouchable due to automatic settings in our point-of-sale software that printed receipts for every transaction. However, staff members were able to work with vendors to add functionality to the register software to make receipt printing optional. Document all the pieces and players. The receipt reduction process encompassed several distinct sub-projects (e.g., capstone course report, student survey, internship project, dining service policy changes), each led by different teams in different units around campus, many of whom never directly interacted with each other. When looking back at the process, it took some time to piece together the whole chain of events and make sure everyone’s contributions were credited properly. We recommend appointing a central person or office to take lead on documenting all efforts as they occur. Develop a continuity plan for student projects. This effort began as a senior undergraduate’s student project. Although Rachel made tremendous progress during the approximately seven months she worked on it, campus operational and policy changes rarely happen on such a short time scale. Integral to the project’s eventual success was engaging a younger student, Kyla, to work directly with Rachel, then continue the project following Rachel’s graduation. In addition, campus staff involvement and unit-level support were crucial to sustain momentum and maintain continuity. Seek common ground among diverse stakeholders. The campus receipt reduction project has found its success through the collaboration of several groups with distinct but overlapping interests. Dining and Culinary Services and the Wisconsin Union strive to provide the best possible service for their customers and maximize the value of their resources; the Office of Sustainability wants to reduce waste and improve campus sustainability; ASM works to address student needs and interests; the Nelson Institute wants to give students meaningful educational experiences. The key to the receipt reduction project has been to integrate and balance each unit’s expertise and requirements toward the shared outcome. Link: News: "Administrative employees honored for improving the campus experience"
Link: News: "University Housing announces receipt reduction survey results"
Link: News: "Campus dining spots going receipt-free"